The reason you NEVER want to ask a caller this question is because they can say NO. What do you want the reply to be? Yes, I do want an appointment. Stop being soft with your callers. You can be polite and assertive at the same time. Are the people answering your phones being too soft and this is affecting how they make an appointment? You need to ask the caller a question that will get a YES! Make sure your caller is ready to make the appointment. You have been building rapport with the caller and now you have their trust. This is when you start to make the appointment. The caller is now ready and willing to make an appointment. The best way to help a caller with a dental concern or problem is to make an appointment for them so they can see the dentist to solve the problem. Asking the caller if they would like to make an appointment sends the message that you are unsure. Stay in control of the call and suggest the next step to the caller. The caller is waiting for you to tell them what the next step is. After all the caller didn’t call to order a pizza. Make the appointment. If the patient decides they really don’t want to make the appointment then they will soon let you know this. People call our dental office because they are looking for two important things. Someone to start to help them and someone to fix their problem. So you need to keep sight of this and not forget this. 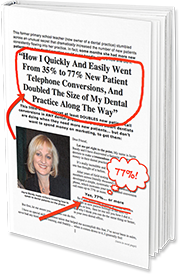 Once you have this mindset you will amaze yourself and make so many more appointments for your patients.